Superior Appearance: This goes a long way in promoting the image of the officer in the field. 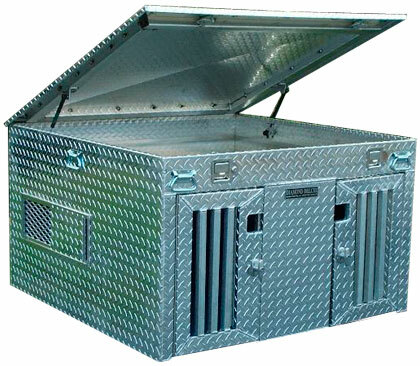 All Aluminum: The DIAMOND DELUXE Portable Unit is constructed entirely of aluminum. This gives it years of durability while never cracking or needing to be repainted like other units. The exterior and floor is TREAD BRITE aluminum. The interior walls are smooth aluminum. Lightweight: The DIAMOND DELUXE Portable Units weigh approximately 100 lbs. This means less wear and tear on the vehicle. Easy Loading and Unloading: This frees up your vehicle for other uses and makes use of multiple vehicles possible. Catch Pole: Catch pole access openings on doors are standard. Closable Vents: One, 10x 14 _ vent on each side of unit with closures and closures for doors are standard. Top Storage: A locking storage compartment on top of the unit is optional. This waterproof compartment is useful for storing catch poles, tranquilizer poles, etc. Insulated: Units have a corrugated plastic liner/insulator on all exterior walls. Locking Latches: Keyed, locking latches on all compartments. Piano Hinges: Full length piano hinges on all doors and top storage lid. Custom Units: We can custom build a unit to your specifications. For more information about our portable units, as well as a photo album of custom units we have built, please visit our companion Diamond Deluxe web site.